A Citizen's Guide to Radon. 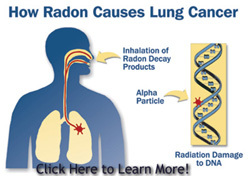 Radon gas causes lung cancer at the rate of 21,000 deaths a year (that's 60 a day! ), second only to cigarette smoke. According to the Center for Disease Control, "more people die from lung cancer than any other type of cancer. This is true for both men and women. "The biggest problem with lung cancer is that there are often no symptoms that it's there until its gone very far," said the Cleveland Clinic's Dr. Peter Mazzone. About 6 out of 10 people with lung cancer die within a year of being diagnosed with the disease. The Lungevity Foundation reports that: "Lung cancer accounts for more deaths each year than breast cancer, prostate cancer, and colon cancer, combined. But Lung cancer gets few of the research dollars because of the perception it is self-inflicted by smoking. In 2003, approximately $1,740 was spent on research per lung cancer death, compared with: $13,649 per breast cancer death, $10,560 per prostate cancer death and $4,581 per colorectal cancer death." A problem with getting people motivated to fix high levels of radon, is that the damage may take a long time to manifest as lung cancer. Depending on the level of radon in your home, the time you spend in your home, and if you have ever smoked, cancer may take years to develop. As busy as we are, we tend to put off fixing what is not perceived as an immediate problem. Science is still studying how cancer develops, but the medical experts agree that exposure to any radiation has a cumulative effect in causing cancer where each new infraction adds to the damage until some critical mass is reached. Factors such as the level of radon, the amount of time spent in the house, the addition of smoking, free radicals in junk foods, and exposure to other radiation such as excessive medical x-rays, along with genetic predisposition, all contribute to reaching the critical mass. The good news is that for those who have been exposed to high levels of radon, they can lower their risks of getting cancer by avoiding exposure to other high risk factors, and, of course, eliminating exposure to radon in their home. "Although radon levels are used as a guide for acceptable exposure and for remedial action, it is inhalation of two radon radioactive decay products that primarily lead to lung cancer: polonium-218 and polonium-214. These daughter elements have very short half-lives, and when they enter the lungs they attach to lung tissue or trapped dust particles and quickly undergo radioactive decay. In contrast, longer-lived radon-222 is mostly exhaled before it undergoes radioactive decay. Alpha particles emitted during decay of radon-222, polonium-218 and polonium-214 are thought to cause cancer by damaging the DNA (deoxyribonucleic acid) in lung tissue cells, resulting in abnormal or tumorous cell growth (Brookins, 1990)." The EPA has produced some PSA's that are available FREE to TV stations. Call your local TV station and request that they air these informational messages. Click here to view the PSA's. To put a face on radon induced cancer, these brave folks share their stories so that others can avoid their fate, For a more personal look at the effects of radon, visit their web site at http://www.cansar.org/ . "My name is Elizabeth Hoffmann and Im a survivor of radon induced lung cancer. Although, I have never smoked, my 15-year exposure to dangerous levels of radon in my home resulted in doctors having to remove the cancerous lower lobe of my left lung prior to my 38th birthday...." (read more). It is a natural occurring radioactive gas found in all soils, but is concentrated in decomposed granite soils like those at Tahoe. Out in the open it dissipates and mixes with our atmosphere to safer levels, but when it seeps into a house it is trapped and concentrates to unhealthy levels. Radon gas is colorless, odorless and tasteless, so you have no idea there is a problem. Smoking combined with radon is an especially serious lung cancer risk. There are many methods of testing for radon which can confuse a homeowner and prevent them from taking action. Any testing is better than no testing. All tests should be done in the living area, on the ground floor, with windows closed and away from heaters and drafts. Follow the directions for each test application. Local hardware stores and lumber yards do not carry testing or mitigation equipment, forcing homeowners to devise their own solutions or to order from unfamiliar catalog companies. (The Solution section lists several radon product companies). Finding a "certified" radon tester and mitigator close to Tahoe can be a challenge. As of 2005, I located two testers in Sacramento, one in Carson City and one in Reno. (See NEHA's list of Residential Measurement Provider). The official California Certified Mitigator page lists only 4 in the whole state, all in Southern California. And I found only one mitigator in Reno. (See Solutions section). Finding qualified professionals is a chore and paying for their travel time is costly. Professional fees for testing and mitigating can run into thousands of dollars. Many homeowners have lacked the knowledge and confidence to tackle the job of testing and mitigating radon themselves. In the Do-it-yourself section you will find the steps I used and the problems I encountered. Non-certified consultants are restricted by California State law from giving advise regarding radon testing or mitigation, so most knowledge has to gained by individual research. The Internet is a big help here. But nearby locations can have dramatically different radon readings, even in the same neighborhoods. Thus you can't generalize or assume your house is safe without testing. The EPA radon maps below attempt to show relative radon concentrations, but are not of much use to the homeowner who is deciding whether to test since high radon levels can be found in low density areas, and low radon levels in the high density areas. Nevada Bureau of Mines and Geology conducted their own study of radon in Nevada in 1989, 1991-1992, and 1992-1993. Here is a link to the summary report: http://134.197.46.69/dox/nl/nl24.htm. Here is a link to a copy of that summary if the above link fails. This may be the same study quoted in the Nevada map above by the Nevada State Health Division since the dates seem to correlate, but the numbers on the map and on the report are slightly different. This report still shows elevated levels for Tahoe Communities, but does not specifically mention Zephyr Cove with 69% of homes over the EPA action level. I present both report and map for your consideration. The California map lacks sufficient detail to show us the Lake Tahoe areas of radon concentration. A study of radon in the Sierras was done by the State of California in 1993 and another was just completed in 2004, but I have not been able to find out the results of either test yet. But remember, radon concentrations vary from site to site so the only way to know if you are getting high concentrations is to test your site. Interestingly, the first Nevada map shows dangerous radon levels in Carson City and Washoe and Douglas Counties in the Lake Tahoe region, whereas the California map averages in Tahoe's high readings with the west slope of El Dorado County to show moderate levels. Again, there is not sufficient detail to make a determination. Only testing proves the point for a specific property. The second Nevada map shows the Lake Tahoe community of Zephyr Cove with 69%, a very high percentage of homes tested with readings above the EPA recommended action level of 4 pCi/L. This was a limited test in 1989 - 1991, but it is the best info we have to date and it is nearly 7 times above the estimated 10% average for all homes in Nevada. 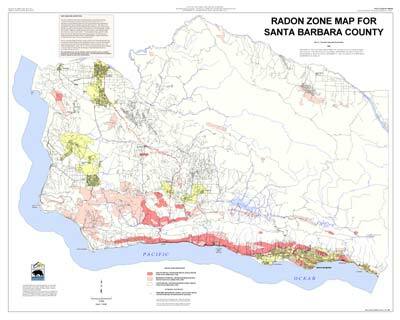 George Faggella, of the California Department of Health Services, Radon Department, has maps for only 2 counties, Ventura and Santa Barbara, with Los Angeles and San Luis Obisbo in the works. To view the PDF files, click on the maps. 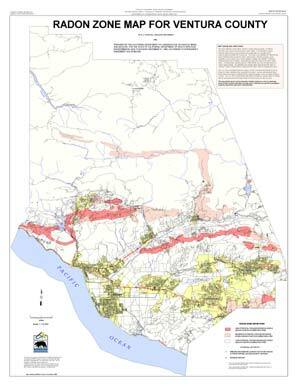 What is interesting to me in this map, which is due to be re-drawn in 2009, is that there are some hot spots in the Santa Monica Mountains, in Chatsworth and in Pacific Palisades. If you live in these areas, take a radon test! Click on the image to download the actual map to check out your area. 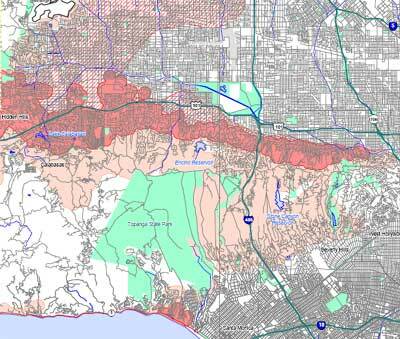 The California Geological Society is in the process of doing Geological Radon Maps for various areas of California. 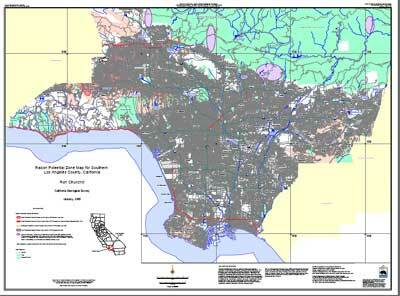 Look for the Tahoe Area Radon Map to be completed by 2009. 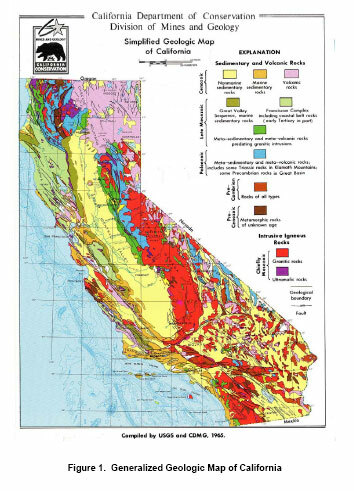 The map below and the full radon report show how much we knew about radon in the Sierra Nevada back in 1991, yet translating science to political action is a task we need to get better at. 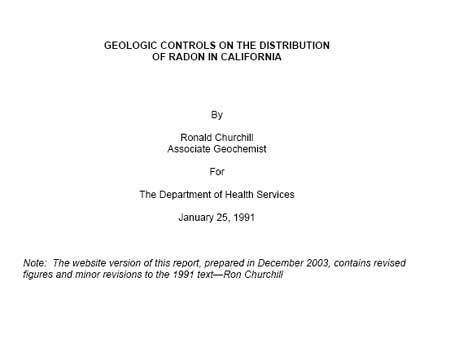 The geological report explains in detail how radon is distributed in California, yet nothing was done about it. This is an example of communication disconnect, or the right hand not knowing what the left hand is doing in government. When will County Government act on this report? My fear is they do not know it exists. Read the full report. Shows granite areas in red. It is interesting that all of the maps below show very high concentrations of radioactivity around Tahoe, in the Sierra Nevadas, and in Western Nevada. I have spoken to several radon testers who have tested homes in and around Tahoe and some areas are known to have higher radon readings than others. Remember that radon is no respector of maps. There can be houses in the hot spots without radon and there can be hot houses in the areas with low radon. Testing is the only way to find out if you have a problem. With that said, here are the hot areas known to the testers. Foothill Road, along the base of the Sierras, has some very hot spots. Alan Bennet of Sierra Radon Services in Reno told me a story of a doctor who purchased some acreage in the Spanish Springs area, between Reno and Pyramid Lake in 1992. He found a home site atop a hill and scraped off the dirt down to the bedrock to build a slab for his house. When the house was completed, he asked some friends at the UNR School of Mines, who were doing radon testing at the time, if they would test his house. When they brought their equipment out they were surprised to find extremely high readings of 80 pCi/L. Scraping away the dirt must have exposed some high uranium content rocks. It took two or three attempts at mitigating but the radon was eventually lowered to acceptable levels. And while we are telling stories, in his book, Radon, The Invisible Threat, Michael Lafavore tells the story of Stanley Watras of Boyertown, Pennsylvania, who, in 1984, discovered radon readings in his home of 2,800 pCi/L, 700 times the maximum considered safe for human exposure. The EPA estimated that it posed the same risk as smoking 280 packs of cigarettes a day. Amazingly, Stanley was able to mitigate the problem and when the book was published in 1987, was still living in the house. Surprisingly, his neighbor across the street had no radon problem! Don't rely on radon maps. All homes, even the worst, can be fixed with proper mitigation. Tahoe homes have higher readings and more of them are over the EPA limits when compared to Carson City and Reno, both of which have high radon problems. According to Shawn G. Price <shawn@radon.com>, National Radon Manager for Air Chek, Inc. (http://www.radon.com), over 58% of the homes tested were above the EPA threshold for mitigating ( 4 pCi/L). This was from a field of 60 houses tested. George Faggella, Staff Environmental Scientist for the State of California DHS Radon Program (916.449.5674 gfaggell@dhs.ca.gov) backs this up with a study of 83 homes showing 63% were over the EPA mitigation threshold. How does this compare to Carson City and Reno? Carson City had 39% over and Reno had 28% over the threshold. Now let's look at the severity of the tests: The average test results for South Lake Tahoe homes was 6 pCi/L while the average results in Carson was 4.1 and in Reno was 4.8. Clearly we have a bigger radon problem than our neighbors, in terms of percentage of our homes that are over the EPA limit and in terms of the severity of average readings for all homes. Yet with the largest problem, Tahoe has the lowest number of homes (in absolute terms, not compared to total number of houses) that have been tested: Only 60 South Lake Tahoe homes are on record as having submitted tests to Air Chek, compared to 107 for Carson City and 266 from Reno. So we have the worst houses and we are doing the least amount of testing. Not so good. Here are some local tests that I am aware of. They were performed using the Pro Series II Radon Gas Detector. This is not a scientific study, only a recording of tests taken and mitigation results as reported to us by those individuals who took the tests. We believe these to be accuarate. 60 to 80 pCi/L as of 3/3/09 This is the higest reading I have seen in this area. The lady had lived in the house for 32 years and had not known about or tested for radon. It was the work of the University of Nevada, Reno, Cooperative Extension's promotion and publicity program that got her to test. What a shame that she did not know earlier! Is There a Radon Problem in the Sierra Nevada Region? First, some definitions: Radon is a naturally occurring, cancer-causing, radioactive gas. It is produced by the normal decay of uranium, an element that is found in nearly all soils (at higher concentrations in shale, phosphorus and granite). Radon gas is colorless, odorless, and tasteless and impossible to detect without a test. The U.S. EPA says that no amount of radiation exposure is safe, but they set 4 pCi/L (picocuries per liter) as the "action level" to use when recommending that a house be mitigated or fixed. Cities or regions can be compared using the percent of homes above the EPA action level, but really, individual homes should be tested to know if they have a problem. To understand our Sierra Nevada region, we need to understand radon exposure in other areas. EPA estimates that about 1 in 15 houses across the US are above 4 pCi/L. That's about 6.6% of all houses in the US. The California Department of Health Services (DHS) estimates that about 1% of all houses in California are above 4 pCi/L. The California DHS Radon Program maintains a data base of all known radon test in the state sorted by Zip Code. I used a spreadsheet to analyze all 59 Zip Codes from the greater Sacramento area and found that 6% of those tests were above the EPA action level. I then entered 25 Zip Codes for 14 communities in the Sierra Nevada foothill and mountain region near Tahoe. They are: Jackson, Pine Grove, Pioneer, Placerville, Plymouth, Sutter Creek, Volcano, Grass Valley, Nevada City, Quincy, Tahoe City, Olympic Valley, South Lake Tahoe, and Truckee. Of the 1555 tests in these mountain and foothill communities, 38% had radon levels over the EPA action level.
. The limited data for this region in the statewide survey indicated 11-45% of homes are above the U.S. EPA action level." This is another instance of an alarmingly high radon areas being identified by one State agency, but not being translated into city and county action programs to fix the problem. So the radon tests show that we have high radon in the Sierra Nevada . The City of South Lake Tahoe had even higher readings, 53% . So why aren't these test results causing more concern? This data is available to the public, why aren't there action plans for fixing those nearly 4 out of 10 houses, or testing more homes, or having building codes changed to reflect our knowledge of radon in this area? What is stopping our knowledge from becoming action? 1. The U.S. Surgeon General has identified radon as a class I carcinogen, similar to tobacco smoke. 2. The U.S. EPA estimates that 23,000 Americans die every year from radon induced lung cancer (that's nearly 60 people a day!). 3. The California DHS has known, at least since the 1988-89 study that up to 40% of all homes in the Sierra Nevada region could have radon levels in excess of the EPA action level. 4. The EPA recommends that ALL homes in high radon areas be tested for radon and fixed if found to be high, and that ALL new homes built in these areas have radon reduction systems. 6. The EPA has developed protocols for fixing existing houses with high radon levels and for building out radon in new homes (Radon Resistant New Construction - RRNC). This literature is free. 7. The Radon Control Methods in Appendix F of the 2003 International Residential Code are available to any building department in high radon areas to incorporate in their local building codes. To date, I am not aware of any building departments that have adopted it in the Sierra Nevada region. 8. The El Dorado County Environmental Management Department left radon out of its Community Update "purple postcard" of public health issues in 2005, choosing instead to include "Storm water." 9. One piece of good news is that the California DHS Radon Program has completed the Tahoe Radon Survey in the Fall of 2007. 7,700 households were asked to join the study in Placer, Nevada , and El Dorado County portions of the Tahoe Basin . 1700 responded and the results were almost exactly the same as the data showed before the study, confirming that Tahoe is a high radon area. We hope to use the results of the survey to get a radon ordinance added to our building code. 10. But sadly, the major players like builders, architects, real estate, environmental health agencies, building inspectors, and even home owners and buyers have pretty much ignored radon. If they would get informed, this group could be a positive force in responding to radon in our community. Conclusion: As always, it falls to individual home owners to take responsibility for their own family's health and safety. If you live in the Sierra Nevada region, test your own home. In fact, if you are reading this, test your home. 43 houses in the Sacramento region had high readings, even though the area as a whole is not a high radon area. The only way to know is to test. If you are building a house, encourage your builder, architect or building inspector to get informed on radon. You might convince a few forward thinking individuals to take radon seriously and to act accordingly. The EPA estimates that only 1 in 15 houses in the US has high levels of radon (4 pCi/L and above). This may be comforting to 14 of the 15 homeowners but leaves 1 homeowner shaking in his boots. But who is the one with the problem? Without testing EVERY home, it's like a 20 year game of Russian Roulette. How comforting is that? And in certain high risk areas like Lake Tahoe and the Zone 1 counties of Ventura and Santa Barbara in California, and Douglas, in Nevada, the estimates from radon testers is more like 1 home in 8. The study above shows 4 in 10 in the Sierra Nevada region and 1 in 2 in the City of South Lake Tahoe! Testing is the only way to know. Local building inspectors and planners have not required compliance with EPA radon standards. In some cases the Uniform Building Codes need to be brought up to date so inspectors make radon testing a part of many home improvement projects. This is done in the medical profession, where your blood pressure is now taken on most routine doctor visits to screen for high readings whether you went in for high blood pressure or not. (I address these issues in "Our Protection" section. Addressing the special needs of new construction radon prevention requires new training for most building inspectors. Read the International Residential Code, Appendix F for Radon Control Methods that could be adopted by any local building department in a high radon area. When buying or selling a home, radon testing and mitigation is only performed if specifically requested by one of the parties, usually the buyer, but agreed to by both. One might think that the time of a property sale would be a good time to test for radon, but many factors work against this. First is the chance that high radon levels will be found and mitigation efforts will take more time and money than the parties want to spend. Once high levels of radon are discovered, the seller must, by law, disclose this fact to all prospective buyers, with the likely consequence of reducing the demand for the house. In a "seller's market", the seller's agent may advise his client to deny the request for testing in the hopes of avoiding a negative report on the record, and simply move on to other interested buyers who may not request a radon test. Termite inspections have become a requirement of property sales in most states, partly because financial institutions want to protect their interests in the house they lend money on. The sad fact that untested high levels of radon gas may cause lung cancer for the inhabitants of the dwellings in 20 years, does not directly effect the value of the property, and as such does not generate pressure from the powerful financial, real estate, or other interests to lobby for changes to the sales requirements. Until the time when politics and economics team up with compassion to make radon testing a requirement prior to a sale, home owners are left with the responsibility to do their own testing and mitigation efforts. Another problem with radon testing for real estate sales is that the parties may wish opposite results and a true and fair test may be corrupted by either party to promote their own interests. Thus the inexpensive laboratory processed test kit or the moderately priced electronic continuous radon gas detector are prone to tampering and not suitable for real estate sales. Certified Radon Testers with their $4000+ anti-tamper, multifunction testing units usually charge $350 to $500, but their services can be trusted to be fair and impartial. If we continue to ignore the problem will it really go away? As our knowledge of radon increases, and public pressure grows, it will be interesting to see how our State and local real estate associations approach radon. Will they encourage radon testing on all houses and rentals? Will they see the testing as being in the best interests of their clients, without being required to by law (self-regulation, if you will)? Please see the comments under Real Estate in the Solutions section. Need to Know About Radon? In May of 1993, the National Association of Realtors (NAR) joined the EPA in urging all Americans to test their homes for radon. NAR encouraged state associations to develop and support legislation or regulation requiring mandatory property condition disclosure, including radon, by the seller. So far, this has not happened in Nevada or California. "In cooperation with the Environmental Protection Agency, the National Association of REALTORS® developed this course to educate the real estate professional on environmental hazards including what to look for and who to call for abatement. Course topics include Health Risks of Radon, Safe Radon Levels, Testing & Mitigation Needs & Methodology, Disclosure Requirements"
Responsible and concerned real estate agents can take courses like these to become informed, to inform their clients and to avoid liability lawsuits. This opens up a can of worms! Over one-third of all housing units in this country are rental units. Most of these are either single family houses or apartments located below the third floor of a building. In most states, owners are required generally to keep their properties "habitable" - safe and fit for people to live in. Fixing a radon problem usually involves repairs to the building. Therefore, it is the building owner - and not the tenant - who is authorized to have this work done. Property owners may simply not choose to test their buildings since they percieve the work to be costly and since even the awareness of a high level reading might require them to do the repairs or at least disclose that information to the tenant or perspective buyers. It is unclear what the legal ramifications of testing or not testing will be. See the Solution section for things tenants can do to deal with these problems. I have heard that nearly three quarters of the home owners at Tahoe don't live here year-round. How concerned should they be about testing and mitigating a house they don't live in much? I guess they could say why bother to take out the garbage or clean the house if they don't live in the house much? When they are vacationing they are living in it and breathing air in it. It's true that the EPA assesses risks of exposure to high levels of radon over long periods of time, so short stays may not cause much of a risk. But who want's to breath dirty indoor air, even for a little while? No amount of radiation is without risks, even significant risks. Non-resident homeowners should at least take the test and then decide if the levels are high enough to warrant the mitigation costs. Currently California offers test kits for $5. Possibly the biggest problem in getting many homeowners to test for, let alone correct, high radon readings, is that it's not a high priority. Radon does not pose an immediate danger. Some homeowners may think "Sure radon is bad, but what's the chance I even have it, or if I do, it may not be high, and then what's the chance I will really get cancer from it? And the whole process is complicated, confusing and expensive. And frankly I am not that comfortable thinking about cancer and death and spending money on repairs I don't know anything about. I would rather be doing something else, anything." Let's face it, if the risk seems small and the hassle is huge, people have other pressing, urgent (and more pleasant) things on their plate, and radon testing often gets put off to the indefinite future. Our goal, at Radon at Tahoe, is to get everyone at Tahoe to test their house for radon and then fix it if it's high. The question is: How do we move the bar of awareness to get people to act without causing undue worry or panic? Luckily, most of us will find no problem. So why get everyone upset? Well, it takes getting everyone concerned enough to test to ferret out the few with the problem. Who of us would deny those folks a solution that only testing will find? And what's the cost? The test is FREE! Of course, if you want the benefit of a continuous monitor to test your house over time and then help your friends and neighbors test theirs, you can buy a continuous radon monitor. Either way don't panic, take action. Take the Test. Termites and Radon: Is there a connection? Will treating a house for radon increase the chance of termites? Will laying down a radon barrier cloth over the previously dry, aired-out soil under a house, change the soil's moisture content to make it a breeding ground for termites? Will effective radon treatment make effective termite treatment difficult or impossible? These questions were brought up by my friend Ole Olson of Mountain Termite of South Lake Tahoe. I did some research and found surprisingly nothing written on the topic so I addressed my concerns to a termite researcher, Dr. Vernard Lewis, of the University of California, Berkeley, a radon scientist at the EPA, and the members of the professional radon group, AARST. Read my letter while we await their response. 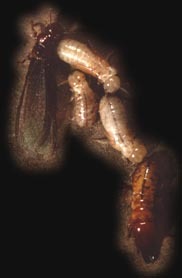 ...A submembrane depressurization technique in theory could weaken ( dilute ) a already existing pesticide application in a exposed earth crawlspace because of the increased ventilation taking place under the membrane. I have no working experience with this theory. The amount of ventilaion that takes place under the membrane would depend on a number of things like : Is the membrane tightly sealed to the foundation walls and to other structural components and how much replacement air is coming from outside the foundation walls. Not knowing the life cycle of termites, I don't think the membrane would stop the termites from returning to the soil because they could go outside the foundation walls. If I'm not mistaken the pesticide application can take place inside and outside the crawlspace foundation wall. So if a radon system is in place the application can take place on the outside. My only recall on a potential problem with pesticide application and radon systems is when a subslab pressurizaion system technique is employed and the pesticide vapors can be forced into tje living space. The consensuses is that radon abatement should not create a termite problem because the system actually dries out the soil in the process of eliminating radon from under the radon barrier. However, what was not mentioned is that a correct radon installation should not have the radon barrier or plastic sheeting attached to wood, either on the support posts or on the sill plate above the foundation wall. Doing so would allow termites to migrate up into the wood, under cover of the radon barrier and be out of view unless the barrier cloth was removed for inspection, a tiresome job! It's important to use a good polyurethane adhesive, such as S-M SM7108 (see Supply Page) that adheres the radon barrier and plastic to concrete block. This will keep all wood exposed to air and allow for visual termite inspection without removing the radon barrier. A 1996 study by the National Institute of Health found that even at the 4 pCi/L "action level" of the EPA, a person's risk of developing lung cancer increased 14% over 30 years of exposure. Excerpt: Based on the eight studies combined, Lubin and Boice estimated that the risk of developing lung cancer increased 14 percent for a person living 30 years in a house with a radon level of 150 Becquerels per cubic meter (Bq/m 3 ). This is approximately equal to 4 picocuries per liter, the level at which the U.S. Environmental Protection Agency recommends taking action to reduce radon in a house. About 6 percent of U.S. houses have radon levels at or above 150Bq/m 3 . The meta-analysis findings are subject to uncertainty because they are based on combined data from studies done in different ways with inconsistent results. But the risk estimate derived from the meta-analysis is very close to the 13 percent increased risk that is estimated by extrapolating results from an analysis of pooled data from 11 underground miner studies to the lower levels of radon exposure in the household setting. "Our results suggest that the current method of extrapolation from miner studies provides a reasonable estimate of the lung cancer risk for people exposed to elevated radon levels in their homes," Lubin said. "The fact that our risk calculations are consistent with the risk figures based on miner studies offers some assurance that estimates of household radon risk are not far off the mark." At my radon lectures I have been asked about the risks of getting lung cancer from various levels of radon exposure. The EPA has attempeted to simplify the answer to that question with the chart below. It essentially shows that living in a house with 4 pCi/L for a lifetime will cause 7 out of 1,000 non-smokers to get lung cancer in their lifetime. Compare this to 36 out of 1,000 if the lifetime levels are 20 pCi/L and 37 out of 10,000 for 2 pCi/L. The chart allows comparisons to smokers and to the general population. View more info on this chart and risk assessment.